Are you interested in visiting the Isle of Skye? You’re in the right place! In this post, I’ll tell you about what to pack for the Isle of Skye for any Isle of Skye weather. Have you already checked my post about our road trip to the Isle of Skye including the famous Oban village? It might answer some of your questions about the Isle of Skye weather and packing tips. Well, well, well… I must tell you, that the Isle of Skye is amazing! However, it only has a very short high season – from May to Septembers. Reasons? The weather. My husband and I took the road trip to the Isle of Skye just in the beginning of June and I would say that we were extremely lucky with the weather – it only rained twice during 2 days we spent on the Isle of Skye. Also, Pepe has been to the Isle of Skye before – in the end of July 2015 and the weather has been slightly different – it was raining all the time during the day, so sightseeing was quite problematic. Let me tell you something – if you don’t like rain, don’t go to the Isle of Skye. It’s certain, that it WILL rain there and you can’t do anything about that. However, it might rain non-stop and it might as well rain just for 15 minutes every 3 hours, you never know. 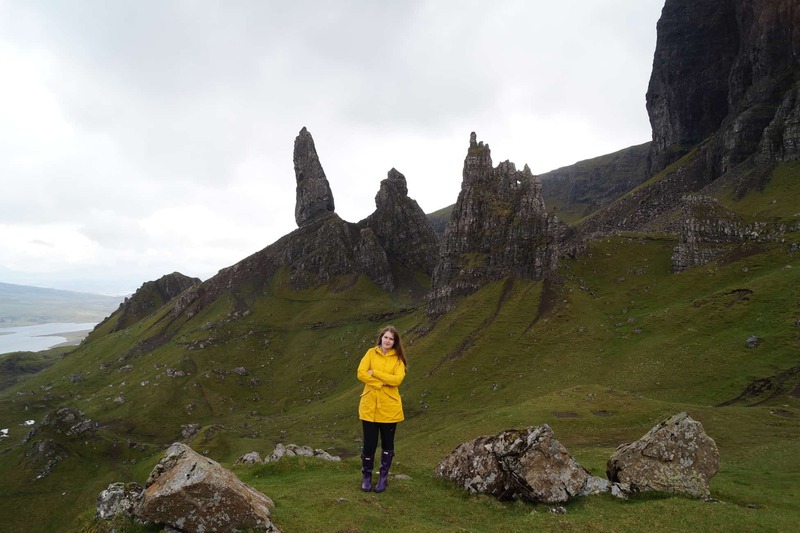 That’s why I decided to write this post and explain, what to pack for the Isle of Skye and when it’s the best time to go to the Isle of Skye, Scotland and tell you about the Isle of Skye weather. Wellies are definitely the best shoes for the Isle of Skye. They are comfortable, waterproof and look great in the photos. 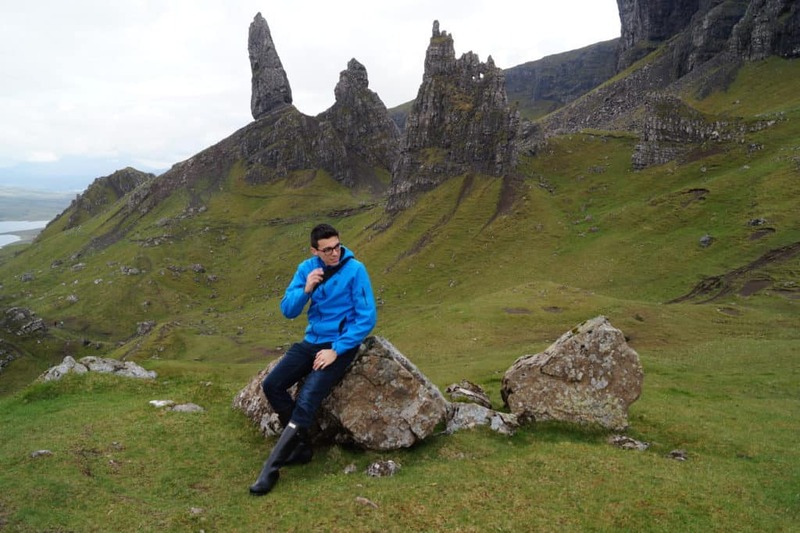 I was even able to hike to the Old Man of Storr with my new Hunter Field boots. They are amazing and I would definitely recommend them to you. Pepe also got a pair of them – in black and they even look stylish. I especially love the colourful Wellies, but you shouldn’t hike for long wearing them. In case you want to bring some shoes besides wellies (and I advise you to do so), consider bringing good waterproof hiking shoes. What about these for men or these for girls? I bought my bright yellow rain jacket last year for the road trip around Ireland and I used it a lot in Scotland too. I brought it with me to the Isle of Skye and it looked great surrounded by Storr mountains. Consider bringing something like my Helly Hansen jacket, if you’re visiting the Isle of Skye in summer. In case you’re going slightly off-season, you need something warmer but nonetheless water & windproof. Check these parkas for girls and these jackets for men. You’ll need warm socks for your wellies and for your camping / motorhome / hotel (sometimes it gets very cold at night), so consider bringing extra warm socks. Mosquito repellent is one of the essentials when it comes to packing for the Isle of Skye trip. You can’t imagine, how many mosquitos there are on the Isle of Skye. The biggest number of mosquitos are probably around the Kilt Mountain, that’s where we opened a car door and 30 mosquitos entered immediately. I could barely take any photos there – I covered my head with a tartan throw and had to run. In case you’re planning to hike on the Isle of Skye, you’ll need a good waterproof backpack ( not a small one, but also not a giant one) – consider this one as an option! Well, the throw doesn’t really need to be tartan, but I thought that it just looks nice surrounded by Scottish landscapes. You’ll need a throw if you get cold to cover yourself in a car or a tent or just outside when exploring the Isle of Skye, if it gets too windy. This is rather an extra – we survived without them, but then again, we were quite lucky with the weather. So take a look as some waterproof pants – they will be very useful for the trip to the Isle of Skye, and it makes sense to pack some with you! However, if you’re going to the Isle of Skye before April or after the beginning of October, be prepared for some really rainy and cold days and sometimes even snow in Winter. Sometimes it snows a lot and you won’t even be able to get to the Isle of Skye, so consider organising your trip around the times of the High season or you can also plan everything last minute (during the low season plenty of properties are empty, so you can grab a great deal). Please, note, that some of the suggestions were sponsored, but all the opinions are as always my own. Interested in more content about Scotland? We’ve got you covered – read about our road trip to Scottish Highlands or the whole Edinburgh category. 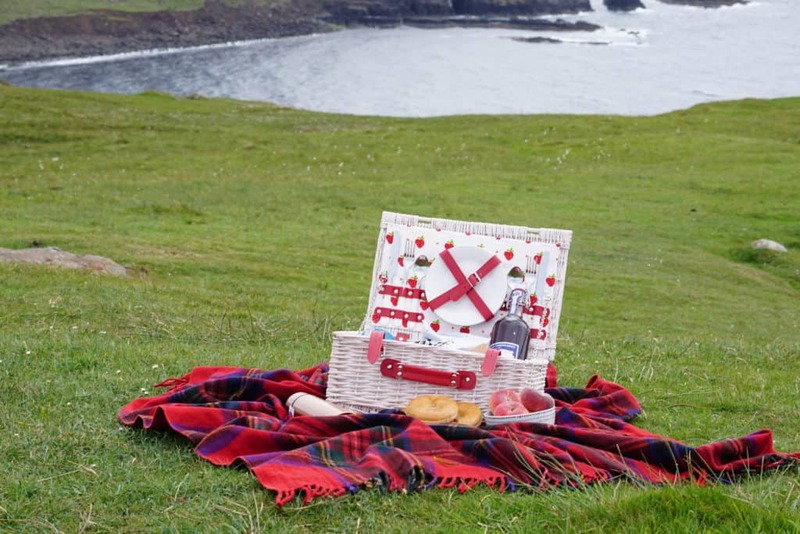 Liked this post about Isle of Skye weather – what to pack for the Isle of Skye trip? Share it on Social Media!